Injured. Worn down. Run thin. 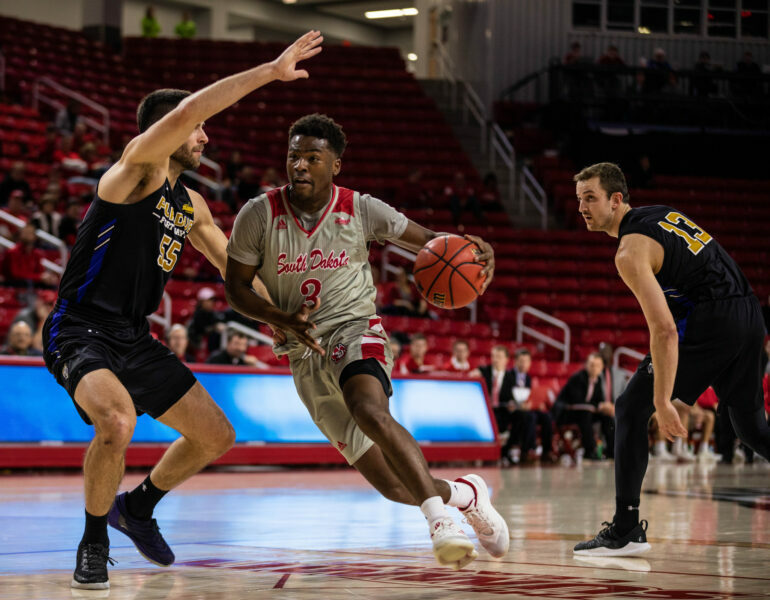 It’s been the story of the 2018 Coyote men’s basketball team, a group whose battle with attrition often decides their fate late in games. That’s why, eight minutes into Sunday’s matchup with Summit League leader Purdue-Fort Wayne (12-8, 4-1), Dan Jech’s limp off the court could’ve triggered another Coyote loss in the Sanford Coyote Sports Center. But the Coyotes (8-9, 2-2), lacking in size and stamina, once again found solace in the hands of sophomore Stanley Umude, whose 28 points, seven rebounds and four assists led his team to an 87-73 upset. Junior Triston Simpson scored 19 points, eight of which came from free throws late in the game to secure USD’s second conference win. Junior Tyler Peterson posted 14 points and ten rebound– his second career double-double. After Jech’s exit, USD fielded seven players the rest of the game. Two (Umude and Simpson) played all 40 minutes. Five reached double-digit scoring figures. All of them recorded at least one point. “The Magnificent Seven”, head coach Todd Lee called them after the game. For a while, the biggest game of the year looked bleak for the Coyotes. USD began the game 4-for-7 from three-point land, finding a 21-12 lead nine minutes into the half. But Jech’s injury forced Umude to the five spot, and the Mastodons took advantage of the Coyotes’ deficiency of size and depth with a 17-0 run to gain a ten-point lead at the five-minute mark. Despite the five-minute scoring hiatus, USD put together a 5-0 run to end the half down 42-37. The Mastodons, however, are a hard team to cool. Led by senior guard John Konchar, who Lee referred to as “the best guard in the league”, Purdue-Fort Wayne leads the conference in three-point makes. Senior Matt Weir put this stat on display, leading the Mastodons with 20 points on 6-for-6 shooting, five of those coming from behind the arc. USD and PFW swapped leads until midway through the second half, where back-to-back buckets from senior Brandon Armstrong sealed a 12-0 run that put the Coyotes up 69-63 with 7:35 to go. Late into the second half, a team low on legs decided to pick up the pace. A steal from Umude turned into two points, and then another from Simpson, and then from Peterson. Lee said he didn’t know where his players’ energy came from, but he did his best to preserve what he could. USD’s lone healthy forward, freshman Matt Johns, scored a career-high 10 points, hitting all four of his attempts. Armstrong also scored 10, hitting 4-of-5 and 2-3 from three to give PFW their first conference loss of the season. Umude himself has stepped up, recording back-to-back 26-point performances to earn Summit League Player of the Week honors. The number of turnovers within that span? One. In response to the sophomore’s scoring outbreak, Lee said Umude’s role on the team is evolving. Up next for the Coyotes is a three-game road slate, beginning with Oral Roberts in Tulsa, Okla. on Thursday.